Provided photo Built in 1902 for Charity Ellan Leonard, and currently owned by Paul and Jennifer Herrmann, this 3,300-square-foot Greek Revival home at 600 N. Downing St., Piqua, will be part of the second annual Holiday Home Tour on Dec. 8. PIQUA – Six historic homes will be featured on Saturday, Dec. 8, when the Piqua-Caldwell Historic District Association hosts their second annual Holiday Home Tour from 5-8 p.m. The tour will include music along the way and tourists will can stop for a “sip or nip” at each home. Among the showcased ho mes will be the Herrmann House, 600 N. Downing St. 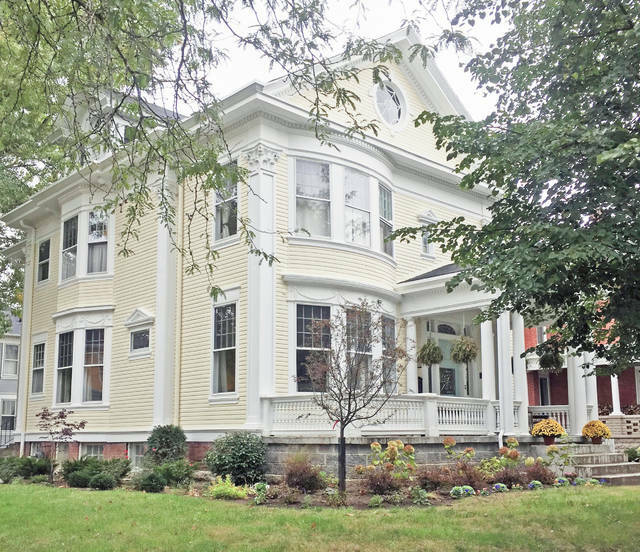 This 3,300-square-foot Greek Revival home was built in 1902 for Charity Ellan Leonard, widow of banker and industrialist Lewis Leonard, who purchased the property on Jan. 29, 1898 for $4,700. She had the home built at the age of 65, but only lived in the house for less than three years, as ill health forced her to live with relatives until her death in 1910. Her husband was a grain buyer for the firms of Orr & Leonard and Orr, Leonard and Daniels, which were involved in international trade in oil and oil cake. This two-story frame residence exhibits Neo-Classical detailing, and shows the effect of Beaux-Arts Classicism on domestic architecture made popular during the World Expositions of the 1890s ). The home includes elements of Colonial Revival (1880-1955) and Greek Revival (1825-1860) architecture. A dentiled roof pediment has a fixed window with tracery. Modest two-story bays with dentil and swag ornamentation project from the east, north, and south sides. Colossal Corinthian pilasters mark the building corners and sides. The notable decorative entrance with entablature and leaded glass fanlight is flanked by pilasters and leaded glass sidelights. The front door showcases original leaded glass and a fleur-de-lis accent. A modest portico entrance is supported by triple ionic columns with Scamozzi capitals. Pedimented roof dormers with Palladian-type windows rest on both sides of the roof. Triangular pediments are above the windows. A circular gable window and fanlight window is in the dormer. A water table encircles the brick and stone foundation. Many original features still exist in the home, such as beautiful stained glass windows, and original woodwork and hardwood floors. Other interesting features include three fireplaces, Rookwood tile, and wide front and back staircases. Interior transom windows facilitate air flow. Having been built by a woman is evidenced through her choice of design and many French-inspired themes. The home exudes an elegant beauty and wonderful flow throughout. The many large windows allow an abundance of light to fill the home. Located in a residential area in the Piqua-Caldwell Historic District with several other large, fine old, homes, it was the first 20th century improvement to this block. Paul and Jennifer Herrmann purchased the home in 2016. The couple made many significant updates, including painting the exterior to a period color, which accurately reflects the graceful style of the home. The interior was remodeled with all new paint on the first and second floors and basement. Hardwood floors were refinished on the first and second floors. The outdated landscaping was redesigned and replaced with new, more formal gardens and perennial beds that grace the entire property. The updates have modernized the home and brought it into the 21st century. Tickets for the Holiday Home Tour are $25 per person at Allisten Manor’s Flower Box, Mainstreet Piqua, and Readmore’s Hallmark. Credit card transactions should be made at Mainstreet Piqua, 326 N. Main St.
Shelley and Chuck Black, co-chairs of marketing and advertising, recommend that tickets be purchased early, as only 300 are available and last year’s tour sold out several weeks in advance. Proceeds from the tour will fund signage identifying historic homes within the district. The association’s long-term goal is to place signs at the perimeter of the district to help accentuate the significance of these historic properties within the City of Piqua. For further information, contact the Piqua-Caldwell Historic District Association at P.O. Box 212, Piqua, OH, 45356.
https://www.dailycall.com/wp-content/uploads/sites/30/2018/11/web1_hermann_cmyk.jpgProvided photo Built in 1902 for Charity Ellan Leonard, and currently owned by Paul and Jennifer Herrmann, this 3,300-square-foot Greek Revival home at 600 N. Downing St., Piqua, will be part of the second annual Holiday Home Tour on Dec. 8.